Pork Chicharon is a famous crackling snack not only among Filipinos but also among the Chinese, Thailanders, Latin Americans, Spanish, and other Europeans. Pork Chicharon is usually made from Pig’s skin or pig skin with it’s fat, deep fried until they are puffy and crunchy. For some, cooking chicharon also involves boiling and drying the pig’s skin for some time and then deep frying it. 1) Place all of the ingredients in a wok or deep fryer. One of the best juices I've ever tried is prune juice. Not because of the taste, it's too sweet and I don't like sweet drinks unless it's cola or chocolate. I like prune juice because it makes me poop. It's my laxative. When my system has gone resistant to my other poop- inducing food, i turn to prune juices before I go for pharmacy-laxatives. Prune juice makes me poop so I love to drink it. And I also need fiber to make some bulk in my poop other wise I'd be having a diarrhea-like, watery stool. 1. Dice the apple, make sure to remove the core specially the seeds. 2. Warm the prune juice a little. Microwave it for 30 seconds. 4. Add the remaining prune juice and blend it at high speed. Drink and prepare to go to the toilet. If I drink this in the morning, I will feel the urge to defecate after lunch. Maybe for others, it will take effect after an hour. Makes 1 serving . Here’s the estimated Nutritional values per serving based on the ingredients used. Calories : 279 kcal Total Fat: 0.3 g.
Cholesterol : 0 mg. Saturated fat : 0.1 g.
Protein : 3.58 g Dietary fiber : 7.5 g.
Sodium : 55.68 g. Carbohydrate : 69.58 g.
I've been into flax seed lately. I add it in most of my smoothies. Just this evening, I thought of adding it to my scrambled egg so that I don't need to add it in my drink anymore. So I did :-) Here's a healthy high in protein and omega 3 supper. Mackerel fillet - 100 g.
1) Grill fish and shred. 2) Beat egg, then add flax seed and pepper. Mix the shredded fish with the egg mixture. 3) Heat oil pan under medium fire. Reduce heat and pour the egg-fish mixture. Lift one side of the omelet and tilt pan and let the uncooked egg to flow underneath. Flip and cook the other side for a minute. Here’s the estimated Nutritional values per serving based on ingredients used. Calories : 401 kcal Total Fat: 30 g.
Cholesterol : 266 mg. Saturated fat : 7.6 g.
Protein : 30 g Dietary fiber : 2.9 g.
Sodium : 179 mg. Carbohydrate : 5 g.
That's basically it. Just want to share with you a very simple yet rich, creamy, and cheesy Pasta Alfredo recipe of mine which I made some years back. Spaghettie or any pasta noodles - 400 to 500 g.
Bacon Strips - 250 g.
Kraft Eden cheese - 250 g.
Knor Chicken Cube - 1 pc. 1) Cooked pasta noodles as directed on it's label. 2) Cut the bacon into pieces and fry until crips. Take out from the oil and set aside. 3) In a low fire, melt Dari cream then saute garlic. Add the mushroom and let simmer for a few minutes. 4) Pour the evaporated milk and water. Stir. Add the chicken cube, nutmeg and pepper and stir until everything is dissolved. 5) Add the cream, eden cheese, and parmesan and stir until the mixture is homogenous. If mixture is too thick, add 1/4 cup of water or more. If the sauce is a bit watery, dissolve 1 tbsp of cornstarch in a little amount of cold water and add it into the mixture. 6) Pour sauce on the cooked pasta and top with the crispy bacon. Serve and eat with gusto. I'd be making pasta alfredo soon when Frederick is here. I just need to figure out what ingredients to use to make it healthier :-) yet still delicious and of course healthy on my pocket. As I have mentioned in my post last night. I am cooking Beef Gyudon today- my way :-). Gyudon is one of those Japanese bowl meals - that is, a bowl of rice topped with any cooked dishes like fish, chicken, pork, and in this case for the gyudon, it is beef. I love Japanese food ever. The Husband likes it too but maybe not as much as I do :-) (He loves sashimi and sushi a lot, you know) Japanese way of cooking is considered as one of the healthiest in the world. And I find it also simple, easy, do ot require very complex ingredients yet, the end product is very tasty. That's precisely the reason why I'm learning to cook Japanese dishes for me and of course for my health conscious husband. Beef, thinly sliced - 200 g.
1) Mix the Chinese rice wine, vegetable water, ginger, and some onions and bring to a boil. 2) Add the rest of the ingredients and cook until the beef is tender. I preferred to have my gyudon with a bit of sauce but if you want it to be dry, then just cook your gyudon until all the liquid evaporates. Prepare your rice on a bowl, though I put mine on a plate. Top it with the hot gyudon. Have some veggie side dish. Mine is a blanched bok chai. 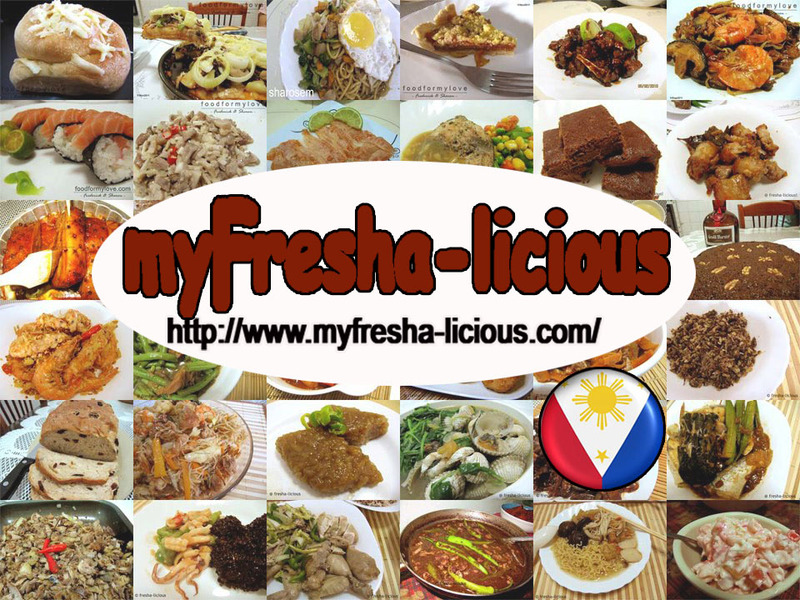 you can add poached or sunny-side-up egg :-). Served with a hot oolong tea to help me digest the beef later. I have difficulty digesting beef, that's why. Here's the estimated Nutritional values per serving based on ingredients used. The sodium content in this recipe is mostly found in the sauce. Calories : 293.3 kcal Total Fat: 10.4 g.
Cholesterol : 84 mg. Saturated fat : 3.9 g.
Protein : 28.8 g Dietary fiber : 0 g.
Sodium : 1,993.7 mg. Carbohydrate : 17 g.
My housemates cooked pinakbet for lunch today. The sight of it makes me drool. But, due to some allergic reaction I have with shrimp pastes and bagoong, all I can do is just stare and drool at the sight of that delicious looking dish, imagining that I am gorging over a plate of rice with pinakbet mixed with a bit of sugar (sigh) You read it right, I mix sugar with the pinakbet sauce and rice on my plate of course. I actually do that when I eat any dinengdeng dish. Now I miss my mama Tessie's pinakbet. - She puts all the ingredients in a pot then add water. she just let it boil until the vegetables are cooked. If she opted to add roastedor fried fish, she will put the fish last. let the pinakbet simmer for a minute or 2 and then serves it. 2) If she cooks Pinakbet with pork. She usually saute' the pork first until the pork is cooked and tender then she adds the rest of the ingredients. I'm tired of my usual wrap recipe. I find the taste boring already. I've been thinking of Japanese food lately. Well, I plan of cooking beef gyudon tomorrow and not now because I'm already tired with my room cleaning. I've been cleaning my room and re-arranging the furnitures since this morning. It's now 6 pm and I'm already hungry. Chicken fillet, skinless - 100 g.
1) Cook chapati as directed on it package. 2) Boil chicken in water and small salt. Drain. Shred chicken and set aside. 3) Shred seaweed and cabbage leaves. 4) Mix the mayonnaise, wasabi paste, garlic, and chicken. 5) Fill the chapati with the chicken mixture, seaweeds, and the cabbage. Wrap and Roll. Estimated Nutritional values per serving based on ingredients used. Calories : 291 kcal Total Fat: 10.4 g.
Cholesterol : 82.85 mg. Saturated fat : 3.8 g.
Protein : 19.42 g Dietary fiber : 3.3 g.
Sodium : 333 mg. Carbohydrate : 20 g.
I've been having this running nose since wednesday last week, I had fever last Thursday, and I feel like going down with a flu since Thursday. It seems that my system is not responding to the muscle relaxant, anti-fever meds, and anti-histamin I've been taking. It's time to shift to other alternative methods to combat these disease :D Actually all I am thinking is to boost my immune-system once more with fruits coz it's been almost 3 days that I haven't been ingesting Vitamin C rich fruits. Combine all of the above ingredients in a blender and blend. This is good for two servings. Estimated Nutritional values per serving based on ingredients used. Calories : 176.51 kcal Total Fat: 2.23 g.
Cholesterol : 0 mg. Saturated fat : 0.21 g.
Protein : 17.20 g Dietary fiber : 1.74 g.
Sodium : 9.23 mg. Carbohydrate : 18.34 g.
Say hello to my high calorie and high fat yet nutritiously healthy smoothie for supper. The calories are mostly from the fats found in the avocado. No worries there :-) because fats found in avocados are healthy. There are studies showing that consumption of avocados daily for three weeks helps improve blood cholesterol. Well, instead of discussing about it further on this entry, I will be dedicating one post about avocados in the next days. Ripe Avocado - 150 g.
Organic Honey - 10 g.
Good for 1 person only :-) This is very filling and tasty. The flaxseed provided an extra nutty taste. Calories : 503 kcal Total Fat: 29.10 g.
Cholesterol : 0 mg. Saturated fat : 3.98 g.
Protein : 11.58 g Dietary fiber : 13.94 g.
Sodium : 16 mg. Carbohydrate : 37.12 g.
Here's a powerful anti-oxidant for breakfast. If you do not know how powerful these fruit combinations are, better read my post on kiwi (Kiwi for Breakfast) and orange (A Touch of Health with Orange). Peel of the kiwi fruit and orange then process all ingredients in a blender. Estimated Nutritional content per serving : this recipe yields 1 serving. W/out honey Calories : 205 kcal. W/ honey: Calories : 305 kcal. Blend all of the above ingredients in a blender. Calories : 270 kcal Total Fat: 5.18 g.
Cholesterol : 0 mg. Saturated fat : 0.68 g.
Protein : 4.8 g Dietary fiber : 11 g.
Sodium : 3 mg. Carbohydrate : 64.1 g.
Recommended readings : Should you wish to know about the causes and symptoms of constipation, please read my post on Battling Constipation: Knowing about it . Chapati wrap - 1 pc. Whitefish fillet - 50 g.
Round Spinach Leaves - 10 g.
1) Cook chapati, just follow the instruction on the package. 2) Grill the fish, dice it after and set aside. 3) Scramble the egg and blanch the spinach leaves. 4) Layout chapati and layer it with the grilled fish, scrambled egg, blanched spinach, and onion. Drizzle with mayonnaise and chili sauce and sprinkel with salt & pepper. Calories : 371 kcal Total Fat: 15.36 g.
Cholesterol : 240 mg. Saturated fat : 5.48 g.
Protein : 21 g Dietary fiber : 3.26 g.
Sodium : 228 mg. Carbohydrate : 18.23 g.
In my daily research on how to deal with my PCOS, improve my health and lose weight the healthy way, I have come across various health issues and concerns, including diverse methods on how groups and individuals deal with them, food and its nutritional values, and different types of diets, fad or not, healthy or not, high-maintenance or not. I have also learned that taking out a certain food group in ones diet is unhealthy. Some diets are low if not totally discourages the consumption of carbohydrates in their meals. Of course one cannot totally take it out from his/her diet because carbohydrate is present in most fruits and vegetables. Carbohydrate is one of the building blocks of food, same is true with fats and protein. Not consuming one of this three is equivalent to imbalance diet which leads to deficiencies, diseases, bad health. Also, high or low consumption of carbohydrate is not all good nor bad. This is where the concept of GI (Glycemic Index) and GL (Glycemic Load) comes in. Let me share what I have understand so far, please correct me if I am wrong on some points and share those which I missed. In my layman’s understanding, GI is the measurement of how fast carbohydrates affect blood sugar level after consumption. In which carbohydrate-rich food is measure on a scale from 0 to 100 according to the rate to which they raise blood sugar levels over 2 -3 hours after eating certain such carbohydrate-rich food). And high GI food are rapidly digested, turned to sugar, and absorbed by the blood and thus resulting to a sudden increase in blood sugar level. Due to their tendency to escalate blood glucose levels at a quick rate, high glycemic foods can be detrimental to health, especially in the long-run (http://www.all4naturalhealth) Low-GI foods, on the otherhand, have the opposite effect, due to their slow digestion, it takes time to convert carbohydrate to sugar, which leads to slower absorption, thereby producing a gradual rise in blood sugar and insulin levels. What do we get / benefit from low GI foods, health wise? To answer that, I have to share the effects of too much consumption of high GI foods. Ingesting a lot of high GI food coupled by a sedentary life is detrimental to ones health because: High GI food causes serious weight problems (excess sugar is converted to fat and stored in the body); it reduces the body’s sensitivity to insulin, degenerate the pancreas, leads to atherosclerosis (due to high triglyceride level in the blood), which contributes to the development of cardiovascular diseases and increases the risk of heart attack and stroke; it also leads to nerve diseases and hypertension; as well as eye and kidney diseases. You got the picture? Low GI food does the opposite effect. - Low GI foods are good for people with diabetes as it helps to control and manage their conditions by reducing insulin levels and insulin resistance. It also lowers the risk of getting type 2 diabetes. - It is also good for those people like me who wants to lose and manage weight as low GI food help control appetite, reduce hunger, and keep one fuller for longer thus delaying the need to eat. - Decreases the risk of cancer which are associated with regular and excess consumption of high GI processed foods. - Most importantly, it helps manage the symptoms of PCOS (polycystic ovary syndrome). However, it is also not all true that excessive consumption of High GI food is bad to the health and there is also a risk with too low GI consumption, according to one article by http://www.whathealth.com , in which excessive low GI intake can lead to inadequate nutrition if the focus is exclusively on consuming low glycemic index foods. This could result in a calorifically high diet, rich in fat, low in carbohydrates and low in fiber. To balance carbohydrate intake or for better dietary practice, glycemic load (GL) needs to be considered also. As defined by www.whathealth.com, glycemic load (GL) is a measurement which ranks the impact of food carbohydrates on blood glucose levels. However the key difference between GI and glycemic load is that glycemic load reflects a specific foods glycemic index and portion size.In essence glycemic load takes into account both the quality and quantity of the foods carbohydrates. In my layman’s understanding the effect of carbohydrate in the blood glucose is affected not only by a foods GI content but also the amount of food intake for that particular food thus the GL. So it is alright to eat high GI food provided it is in small amount/portion size only and low GI foods in larger portions / quantities in order to regulate GL. It is very important to consider these two factors, GI & GL, to better understand the effect of food on our blood sugar in order to better manage it. Some diet programs recommends intake of not more than 40 GL per day in order for an individual to lose weight. So shall we start counting those GIs and GLs? Alaska Pollock Fish Fillet - 100 g.
1) Cook Chapati as directed on its packaging. 2) Grill the fish fillet. I didn't add anything. 3) See the recipe and preparation for the salsa from my previous post. Just take out the lemon juice and you're good to go. 4) Layout the chapati and arranged the fillings on the chapati. wrap, roll then wrap with wax paper so that eating it will not be messy. Drizzle with the mayonnaise as you eat it. Calories : 282 kcal Total Fat: 5 g.
Cholesterol : 55 mg. Saturated fat : 2 g.
Protein : 27 g Dietary fiber : 4 g.
Sodium : 267 mg. Carbohydrate : 20.4 g.
Ground Beef - 250 g.
1) Saute garlic. Add onion until the garlic is aromatic. 2) Add beef when the onion wilts, let simmer until the beef changes in color. This recipe makes 3 servings. Calories : 233 kcal Total Fat: 11.58 g.
Cholesterol : 70.83 mg. Saturated fat : 4.05g. Protein : 25.52 g Dietary fiber : 2.17 g.
Sodium : 557 mg. Carbohydrate : 23.42 g.
1) Wash the orange thoroughly by scrubbing it with a dishwashing scrub and soap and rinse it in running water. 2) Slice the orange into small pieces (include the peel) add water and blend. Aside from steaming and blanching vegetables. I also cook veggies this way - buttered. Butter, salted - 10 g.
Cauliflower, cut into small pieces - 150 g.
snowpeas, sliced into diagonal wedges - 50 g.
1) Melt Butter in low fire then saute garlic on it until it is aromatic. 2) Add the rest of the ingredients. Let it simmer for 2-3 minutes. Serve with any grilled fish, poultry, or red meat. Calories : 75.71 kcal Total Fat: 4.69 g.
Cholesterol : 10.57 mg. Saturated fat : 2.48 g.
Protein : 2.7 g Dietary fiber : 2.39 g.
Sodium : 273.88 mg. Carbohydrate : 5.12 g.
Yee mee (dried egg noodle) - 75 g.
Xiao Bai Cai (pechay) - 250 g.
1) Sauté Garlic and ginger in 1 tsp of sunflower oil. Add the onion when aroma starts to be released. 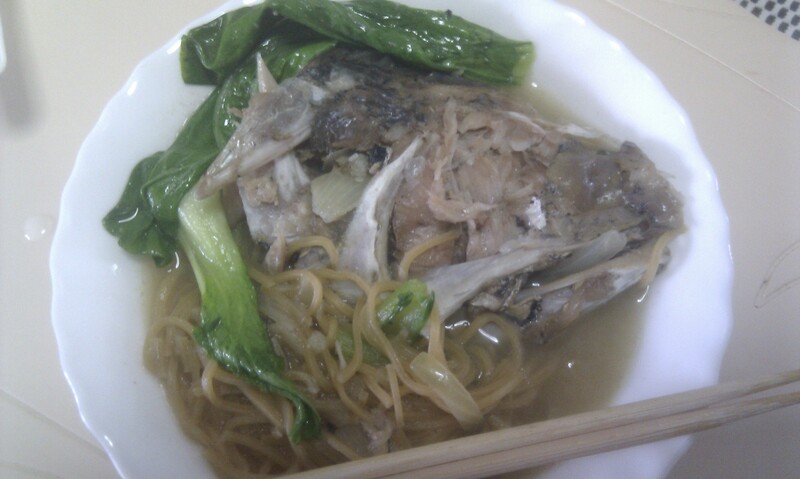 2) When the onion wilts, add the fish head. Stir and simmer for 5 minutes. 3) Add all the liquid ingredients and let it boil for 5 minutes. Add the veggies and let it boil again until the veggies wilted. 4) Scoop out the chicken and veggies. Set aside. 5) Add the noodles, ground pepper, and salt to taste if needed. Cook noodles. 6) Put back the fish and veggies. Remove from fire. Serve hot. This dish turned out delicious :-) and the fish is not as fishy as I was expecting it to be. Estimated Nutritional values per serving based on ingredients used. The sodium content however, does not include those found in the chicken broth. Calories : 436 kcal Total Fat: 14.2 g.
Cholesterol : 141 mg. Saturated fat : 2.4 g.
Protein : 45.6 g Dietary fiber : 2.3 g.
Sodium : 139 mg. Carbohydrate : 29.1 g.
I usually do not blend fruits with other non-fruit food. Fruits are believed to be easily digested, that is, our stomach grinds it and absorbs their nutrients in less than an hour. While for other food specially red meat, it takes more than one hour to digest them. When fruits are combined with non-fruit food, digestion takes longer which leads to the fermentation of the fruit inside the stomach making them acidic. That in turn causes an upset stomach and farting at the least. And it turned out for me, it caused me an upset stomach and a 3 times visitation in the toilet which is great for me :-) Of course, I used milk in this recipe which probably had caused the chaos in my stomach. Place all of the ingredients in a blender then press pulse for a smoother puree. Add ice cubes for a more refreshing smoothie breakfast. Orange fruit is that orange oblong thing found in supermarkets and wet markets or any fruit stands that is a great thirst-quencher and refresher. The taste is a wonderful blend of sweetness and sourness. It has a very rich flavor which makes it so popular in almost all culture and is preferred by some, if not most, people of all age group. - Promote good cardio-vascular health due to a good amount of potassium and calcium. -Orangeprovide a good source of fiber (2.06 g from a 131 g. fruit) thereby preventing constipation and improving the health of the digestive organs. - Drinking ½ liter of pure orange juice per day prevents kidney stones. - The vitamin C in oranges can prevent peptic ulcers and reduce the risk of developing stomach cancer. This is a simple oil-based pasta, one of my favorite way of cooking pasta :-) However, as you can see, it is not that healthy due to it’s high carbohydrates and calorie contents but still considered healthy because this dish is high in protein and low in cholesterol and sodium. It's caloric content mostly came from the oil and the pasta. Anyway, I wanted something new for the week so I made one last night. I’ll just burn off the calories in my work out later. I made Bangus Spaghettie alla puttanesca. 1) Cook the spaghetti as directed in the package. Set aside. 2) Microwave the fish for 2 minutes. Let it cool then shred afterwards, make sure to remove all the tiny fish bones. 3) Saute' garlic in grapeseed oil until it is aromatic, don't let it get toasted. Add the shredded fish and mix. 4) Toss in the spaghetti, and add the remaining ingredients. Calories : 680 kcal Cholesterol : 67 mg. Protein : 41.35 g Sodium : 122 mg.
Veggie wrap again for lunch today. I was lazy to cook last night because i went jogging for almost an hour and t'was so tiring, so I decided to just throw in something that’s easy to prepare and cook for my packed lunch the following day. So I thought :-( I should have just grilled or boiled anything from the fridge and steamed vegetables, it could have been much (for emphasis) easier. 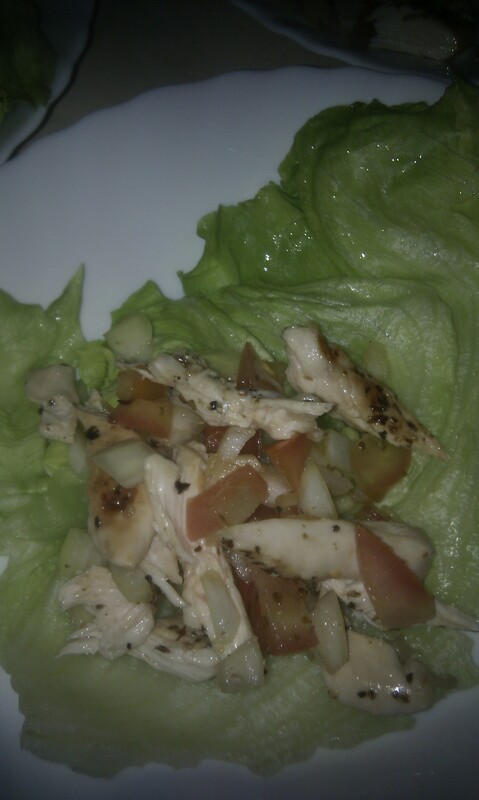 Grilling the chicken, chopping the tomato and onion, and then wrapping it with the lettuce leaves really made me irritable because it was so laborious and messy! Either that or I’m just really grumpy. Well, I’ve been grumpy, oh just moody, for quite some time already. Anyway, I have to really practice wrapping using leaves. I can’t even take picture of my wrapped food because it looks so mussy. Terrible. Something healthy and filling are the considerations too for this dish. Lettuce leaves – 4 large pcs. Chicken fillet, skinless – 100 g.
2) Grease the grilling pan with the olive oil. Drizzle the chicken with the herb blend and ground pepper and grill until each side turns brown. 3) Remove chicken from grill and dice. 4) Combine the diced grilled chicken with the diced tomatoes and onion. Add salt if you wish. You can also add more of the herb blend and ground pepper. 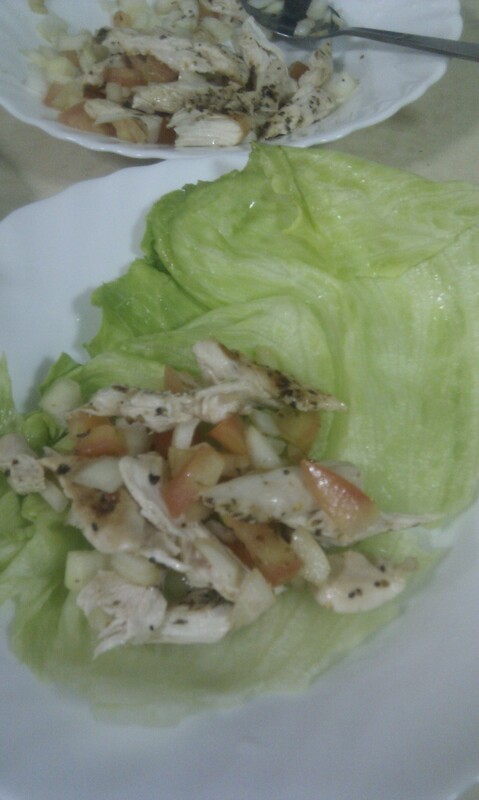 5) Arrange the filling on top of a lettuce leaf, wrap and roll. Calories : 80 kcal Cholesterol : 40 mg. Protein : 14.7 g Sodium : 37 mg.